In her widely shared “Two Views of Pope Francis” Ms Noonan unnecessarily condescends the Pope and his economics, and regrettably plays the Wall Street victim to the Pope’s cautions about capitalism. Ms Noonan’s experience with capitalism is legitimate, from her vaunted perch as a presidential speech writer and Wall Street Journal columnist. She has lived and worked at the center of American political and economic power, and she fervently believes in the free market’s power to unleash human potential, create wealth, and contribute to the common good. Her experience is legitimate. But so too is Pope Francis’ experience. He has ministered in the slums of Buenos Aires, at the tip of a continent whose politics and economics is covered with American fingerprints – political, military, and economic. He has seen the worst of capitalism’s imbalance, mixed with corruption and imperialism, and he rightfully has his concerns about capitalism – particularly its underside. Instead of condescending the Pope as someone who, “doesn’t, actually, seem to know a lot about capitalism or markets, or even what economic freedom has given—and is giving—his own church,” Ms Noonan could perhaps consider as valid the Pope’s perspective as one who has lived on the other side of the world’s economy, and refrain from playing the victim of an otherwise powerless spokesman who speaks truth about the poor. Please read her article (linked, below). It reflects Ms Noonan’s faith and affection for the Pope, and her deep commitment to the free market. But ultimately I find her commentary flawed in its failure to see the legitimacy of another perspective of the global economy, one deeply rooted in personal experience and in longstanding church teaching. If All Lives Matter in our society, there wouldn’t be such disparate experiences of violence or of poverty along racial lines. Yet an examination of crime statistics, of poverty statistics, of education statistics, of employment statistics and so forth, shows that clearly our society does not act as if All Lives Matter … or, at least, do not matter as much as other lives. “Black Lives Matter” is a necessary mantra, no matter how imperfect those who chant this slogan. Black Americans are disproportionately the victims of violence, of an imbalanced justice system, and of all kinds of social and economic struggles, of a direct and evil legacy of slavery and of Jim Crow and of all the ways that racism has manifested itself in our society. “Black Lives Matter” shakes us from our resignation to, and tacit acceptance of, a broken society that lets such disproportionate violence and suffering happen to one group of people … for generation upon generation. “Black Lives Matter” reminds us that we cannot accept a society where one class, one group of people struggle so. much. more. than others. “Black Lives Matter” calls us on the fact that, as a society, we have conducted our affairs as if Black Lives Do Not Matter … or at least, do not matter as much as other lives (3/5ths, perhaps?). Black Lives – lives which our society has too often disregarded and devalued – Matter. Why is such a statement so divisive? Perhaps because we don’t want to face our own racism, past and present. “Blacks Lives Matter” says just that. Black lives matter. It does not say that other lives do not matter. It does not say that Black Lives Matter more. No. It just says that Black Lives Matter. Period. And this is a truth that our society seems to have forgotten … or perhaps never quite knew in the first place. please). But it is an important truth. If we are to be a society of liberty and justice, a society that some claim is Christian, we will embrace a slogan that lifts up the value and dignity of those that our society has historically devalued, and we will demand liberty and justice for those to whom it has been delayed and denied. “Black Lives Matter.” It needs to be said in a society that too often has conducted its affairs as if Black Lives Do Not Matter. Even if Especially because it is hard to hear. On Sunday my congregation prayed for the teachers and staff of our community’s schools. We prayed for them by name – over 100 of them. 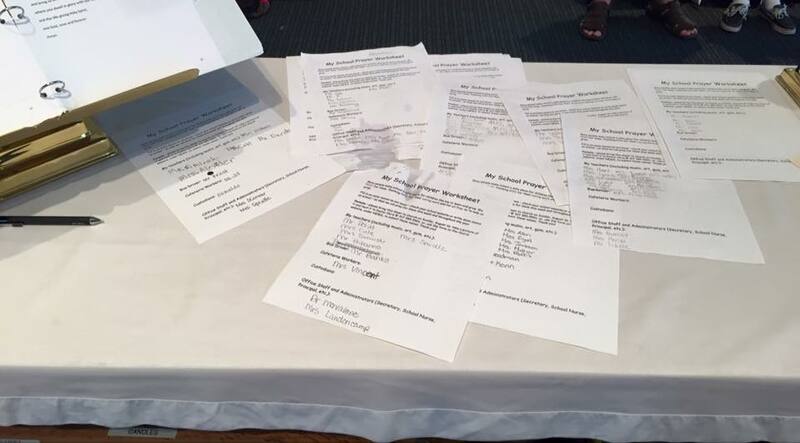 I asked each student in my church to make a list of their teachers and their school staff – office staff, cafeteria staff, maintenance staff, etc.. To help them with this task, we had an online form on our website that families could use to submit names. We also had a My School Prayer Worksheet kids could download, complete, and bring to church. We also had blank forms at church that many kids filled out that morning. The prayer took place during the Children’s Message, and also included a Blessing of the Backpacks (a “back to school” theme for the Children’s Message). I spoke briefly with the kids about the good and holy things they are doing at school, and the people whose holy work it is to care for them and help them learn. After thanking God for all who care for our children and help them grow and learn, I read all the names that were given to me. It was a bit ridiculous, and it took some time to read the 100+ names (which I tried to do with speed yet also with dignity), but it was so worth it. Praying by name for our teachers and school staff was a powerful experience, and a very vivid reminder of all the people in our community who are committed to the care and education of our children. One member of the church commented that it was great not only to pray for her kids’ current teachers, but to pray for teachers her children had in previous years whose names were submitted by younger children in the congregation. At the end of the prayer the congregation cheered and let out an enthusiastic applause. It may have been a cheer of relief at the end of such a long prayer … but I’m much more inclined to think that the congregation was truly joy-filled by naming in prayer so many teachers and caregivers whose vocation it is to nurture our children in learning and growth. Such people truly merit not only our prayers but also our cheers. I’m glad we did both. After the Children’s Message and prayer, I spread the prayer sheets over the altar. Those names were there as I preached (yes, I preach from the altar), led the Prayers of Intercession, and as I presided at Holy Communion. It was particularly powerful for me – and I shared this observation with the congregation – to prepare to serve the food and drink of the Lord’s Supper as the names of cafeteria workers graced the altar. Holy Food. Holy People. Holy Callings. It was a good Sunday, and an experience I’ll certainly do again in the future. 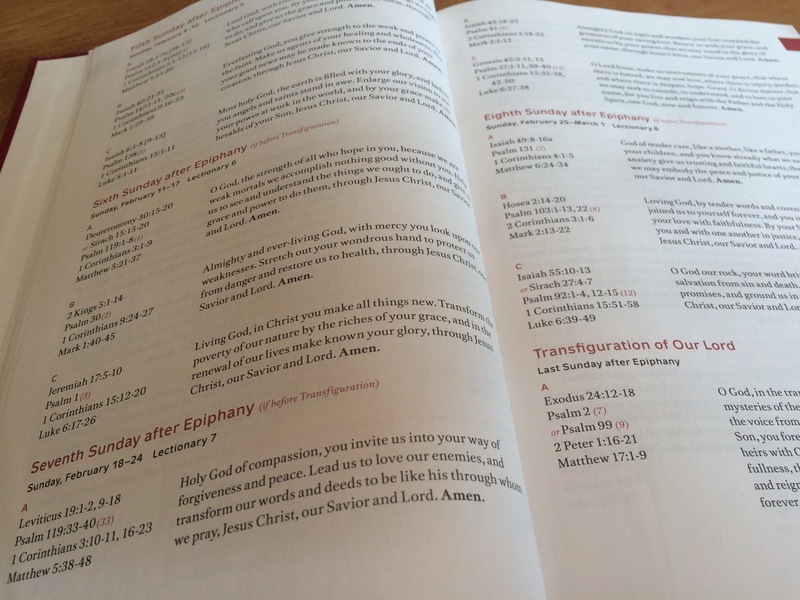 The Revised Common Lectionary, as it appears in the front of the pew edition of Evangelical Lutheran Worship. On many occasions I have been asked by friends and colleagues why I do not use the Revised Common Lectionary (RCL) in my congregation. Often these questions come from a place of honest curiosity. Sometimes they come from a place of liturgical condescension. Either way, my answer is rather simple – it’s mostly because of how the RCL treats the Old Testament. But there’s more. So, here are the reasons why I left the RCL behind. 1. The RCL presents Old Testament texts only in relation to the Gospel text. This is pretty bad. “[T]he Old Testament reading is closely related to the gospel reading for the day” (Introduction to the Revised Common Lectionary, 11). This is problematic in that Old Testament texts are chosen only in relation to a gospel counterpart. The result of this pairing is that the story of God’s grace and promise in the Old Testament is told in no sequence or narrative but only as it relates to, or previews, a gospel parallel. Whereas the gospel moves sequentially each week, chapter by chapter through the story of the life of Jesus, the Old Testament reading jumps around to provide no sequence or cohesive story of God’s work among the people Israel. For example, for the six weeks from the Third Sunday after Epiphany through to the Eight Sunday after Epiphany, Year A, we read from parts of chapters 4, 5, and 6 of the Gospel of Matthew. For the first reading, we read from Isaiah 9, Micah 6, Isaiah 58, Deuteronomy 30, Leviticus 19, and Isaiah 49. While these pairings are appropriate and shed light on the context of the Gospel, as a unit these selections do not tell a coherent story of God’s movement among God’s chosen people. The RCL identifies the “problem” of how to read and use the Old Testament in Christian worship (Introduction, 40-44). Bafflingly, it paints extremes of excluding the Old Testament altogether from Christian worship (on one hand), or of reading it only as Scripture and prophesies that have been fulfilled by the New Testament writings (on the other hand). It rightly recognizes that the Old Testament is Scripture that can be read and exegeted in its own right. Yet, it oddly suggests that attempts to do so would result in reading Old Testament texts “at eucharistic worship, or Christian worship in general, as though there were no linkage with Christian belief and prayer” (Introduction, 42). “No linkage”? This is laughable. The editors of the Revised Common Lectionary seem here to forget that Scripture is read in worship surrounded by Christian hymns, prayers, preaching, and sacraments. For about half of the year the RCL offers an alternate cycle of “semi-continuous” Old Testament readings. In Year A this cycle begins in Genesis; in Year B in 1 Samuel; and, in Year C in 1 Kings. This semi-continuous cycle corrects some of what I find problematic in the RCL, if only for half of the year … much of which falls during the summer months (see #4, below). 2. The RCL is too focused on the four evangelists – Matthew, Mark, Luke, and John. There’s lots of Good News throughout Scripture, Old Testament and New Testament. And though the RCL covers lots of Scripture in its three year cycle, it does so with an unnecessarily limiting orientation to the first four books of the New Testament. Christian preachers are more than capable of proclaiming, and Christian congregations are capable of hearing, the wonder of God’s saving work without a requisite weekly reading from Matthew, Mark, Luke, or John. This is especially true in liturgical and sacramental traditions, whose liturgies and hymns are filled with imagery from the Gospels. 3. The RCL skips the Old Testament during the most important season of the church year. The RCL replaces the Old Testament reading with passages from the Acts of the Apostles during Easter. Acts is fantastic. This is true. But that it supersedes the Old Testament reading during the Easter season does a disservice to the relationship we claim exists between the Old Testament promise and the New Testament’s witness to the resurrection. 4. The year is all off. I know. The church year begins in Advent, and the RCL has a beautiful internal integrity that flows throughout the cycle of the church year. Yet, most of our congregations follow a program year calendar that closely tracks the school year. Sunday School, youth group, men’s or women’s groups, and other ministries often meet during the school year, and often take the summer off. Attendance dips during the summer, and in August or September the programming kicks up – and so does the attendance. September is the start to a new year. Many of our congregations fit into the RCL’s December-November cycle awkwardly, at best. Meanwhile, the internal integrity of the RCL is lost as major portions of the life and ministry of Jesus are proclaimed during the summer months of low attendance and suspended Christian education. 5. The unity achieved by the RCL is overstated. When I share that I set aside the Revised Common Lectionary, I am often asked about the unity that the RCL fosters. The unity of the church is found in Christ, in the proclamation of the Word and the sharing of the sacraments, and in our shared witness to the resurrection. It is too easy to overstate the significance of a shared cycle of readings – as if the unity of the church depended on the selection of readings for worship! Most of the “unity” fostered by the RCL’s cross-denominational use is experienced by clergy in text studies, online clergy groups, worship planning resources, and so forth. Very few and very far between are stories of Lutheran and Presbyterian laity gathering for lunch after worship to talk about their pastor’s sermons on the same texts. And while common practices across church bodies are perhaps desirable, the churches that use the RCL inhabit a shared theological space and heritage such that any variation in their Sunday reading schedules would hardly inhibit the unity they already have in liturgical practice or public witness. “But you’re tearing the church apart by abandoning the RCL!” Congregations that set the RCL aside are hardly abandoning the unity of the church. A Christian community that selects an alternate lectionary or develops its own is more than capable of teaching and preaching and carrying out acts of service and care. Such congregations continue to proclaim Christ within and beyond their walls. Such congregations continue to follow the ebb and flow of the church’s principal festivals. Most continue to gather around Word and Sacrament. Setting aside the 1992 RCL is hardly a crushing blow to church unity. Claiming the lectionary is a linchpin to church unity does a disservice to the unity we share with Christian churches that do not use the RCL. I didn’t depart from the Revised Common Lectionary lightly. I take seriously its wisdom and beauty and yes, its shared use. I’ve written prayers for Bread for the Day, a Revised Common Lectionary daily devotional. And, I have at times in my life committed to daily prayer rooted in the movement of the RCL’s daily lectionary. Nonetheless, as noted above, I find the RCL lacking mostly for its treatment of the Old Testament, but also its calendar orientation that doesn’t fit well with the life cycle of my (and many other) congregations. When I began looking for alternatives to the RCL over three years ago, I considered the Narrative Lectionary; a year-long program such as The Story; or a series of shorter-term thematic series. I ultimately landed on the Narrative Lectionary, and have found it to be a wonderful guide for using Scripture in worship, and I have found its online community to be faithful, diverse, and creative. I drove past a church today that has two flag poles on its property – one for the American Flag, and one for the Christian Flag. 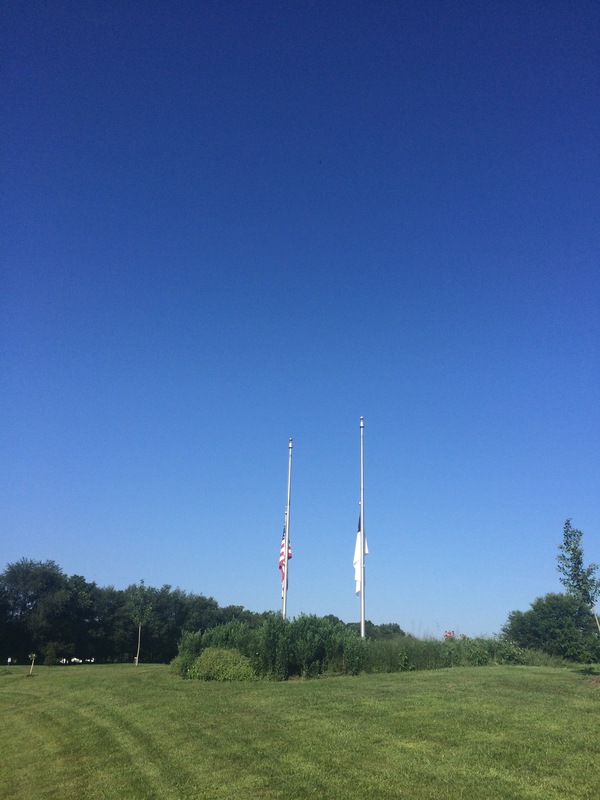 They were both flying at half staff in an act of public mourning for the victims of the Chattanooga shooting. Now, I find the Christian Flag to be somewhere between silly and heretical. Flags are emblems of nation states, signs of a government’s authority over territory and people. Christianity is not a nation state and it needs no flag. Our Lord Jesus rejected efforts to give him the kind of authority that a flag represents. Christianity’s symbol is a cross on which our Lord found victory through death (not conquest), and power through weakness (not might). On that cross, our Lord bid us to do the same. To that end, I find the impulse to slap a cross on a political symbol to be odd, at the least. Nonetheless, the Christian Flag gave me a different kind of pause today, as it flew at half staff. I am accustomed to seeing the American flag flown in such a manner, a sign that calls us to public mourning. But to see the cross similarly flown, well, that struck me. It reminded me that Jesus grieves. Our Lord grieves at the senseless death of any of his children. Our Lord grieves at the sin that grips our nation and world. Our Lord grieves when the demons of anger or sickness or passion or evil possess any of his children and lead them to take the life of another. Yes, our Lord grieves at the brokenness of our world – a world that produces enough food to feed all people, but does not have the will to do so. Our Lord grieves at all the -isms which, coupled with the power of majority rule or government mandate or social acceptance, keeps people from realizing the fullness of their promise in God. Our Lord grieves, because our Lord loves. I’m no fan of the Christian Flag, but on this day I am grateful for its humble flight at half staff that recalled for me the grieving Lord of love who is present with us in our sorrows and sufferings, and who shows us a better way. “‘All things are lawful,'” but not all things are beneficial. 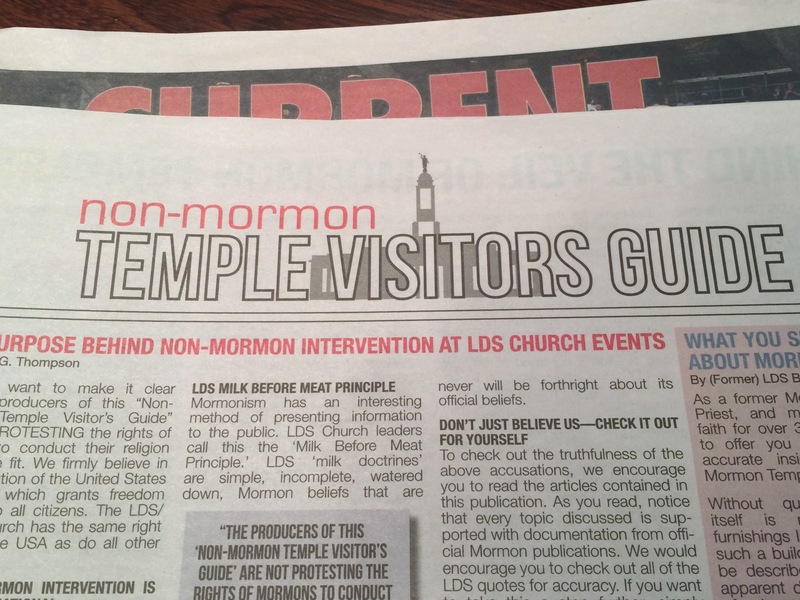 This week The Current in Westfield and The Current in Carmel included a 12-page “advertising supplement” entitled “Non-Mormon Temple Visitors Guide.” In this “guide” provided by Tri-Grace Ministries of Ephraim, Utah, you’ll read all kinds of claims about the Mormon faith written by non-Mormons and by people who claim to be former Mormons. Twice on the first page this “guide” refers to Mormon teaching as “deception.” I’ll go out on a limb and suggest that this is not an entirely fair “guide.” This guide may be sincerely written by people of faith, but it is harmful to our community and particularly to our Mormon friends and neighbors. It is entirely lawful for The Current to run this “advertising supplement.” The First Amendment protects and guarantees their free speech and that of the authors of this “advertising supplement.” But this massive “advertising supplement” is not beneficial. It does not build up our community. Next week will The Current run a 12-page screed against Jews? Roman Catholics? Muslims? Lutherans? Homosexuals? No matter what theological qualms some may have about the Mormon Church (or the Roman Catholic Church, or Islam, or Lutheranism, or whatever), it does not build up our community when a public asset such as The Current distributes divisive and biased literature to every single household in our community. Rather than spread divisive and biased literature, The Current should seek mutual understanding, interpret the words, faith, and actions of our neighbors in the best possible light, and celebrate when members of our community celebrate (such as our Mormon friends are doing this week with the opening of their new Temple). We are to fear and love God, so that we do not tell lies about our neighbors, betray or slander them, or destroy their reputations. Instead, we are to come to their defense, speak well of them, and interpret everything they do in the best possible light. I am attending an Open House at the new Mormon Temple in Carmel next week. I am doing so to learn more about the Mormon faith so that I can “come to their defense, speak well of them, and interpret everything they do in the best possible light.” I am also attending the Open House so that I can stand with my friends and neighbors against the unfair attacks and slander they experience all too often. Theological differences between the Mormon Church and the Lutheran Church are real. But so too is the unfair treatment our neighbors, friends, and fellow children of God of the Mormon Church receive to this day. My friends and neighbors don’t deserve to receive, on their doorstep, such a publication. I cannot remain silent. I have to speak out. For me, living a life of faith is not about projecting my faith into the public square to the detriment of others, or seeking public assets – be they government or business – to enshrine and propagate my faith through their power and reach. Instead, living a life of faith is about coming to the defense of my neighbors, seeking the good of the community – particularly the most vulnerable and “least of these” (Matthew 25:40) – living into the promises of the coming Kingdom of God, and having the opportunity to worship and live according to the dictates of faith. I pray for mutual understanding among the faith communities of Westfield and Carmel. I pray for a renewed commitment by our communities to seek the common good. I pray for God’s grace to strengthen us, and especially those oppressed by bigotry and prejudice of any kind. After three days I have turned off comments on this post, as the conversation in the comment thread was no longer constructive. We all seem to be talking past each other. Thank you for the conversation and for sharing your different points of view on this matter. Remind me not to take vacation during the last week in June ever again. I remember watching the Phil Donahue Show one summer in late June as a kid, shortly after school let out (I was a really fun kid. Really.). They were talking about the constitutionality of burning the American flag in the wake of United States v. Eichman, a case that ruled as unconstitutional laws that banned the desecration of the American flag on free speech grounds. The guests were passionate. The audience members were opinionated. There was lots of energy around this issue. From that moment I got more and more interested in both politics and in the flag, and I learned quite a bit about both. I read the Constitution and the Flag Code, and various opinions about both. One of the lessons I learned is this: even though school is out and summer has started, late June – when the Supreme Court releases its most anticipated rulings – is one of the most consequential times of the year for our country. In the past week, the Supreme Court has ruled on marriage, healthcare, environmental protections, fair housing, and congressional redistricting, among other issues. Together with the outrage following the massacre at the Emanuel AME Church in Charleston and the heated – yet very important – discussion surrounding the Confederate Flag, it was a significant week for our nation. Now, in the midst of all this news and critical issues before our country, the church cannot be silent. At the least, the church and its leaders should seek to make sense – in terms of faith – of what our society is experiencing in this moment. Even more, the church and its leaders should be public voices for justice. After all, a lamp isn’t lit to be set underneath a bushel (Matthew 5:15), the call of a prophet is to cry out loudly against injustice (Isaiah 1:23, for example), and the kingdom of God is not a matter of words but of power (1 Corinthians 4:20). Cries for the church to stay out of politics, and for preachers to speak on matters of faith not politics, miss the point. 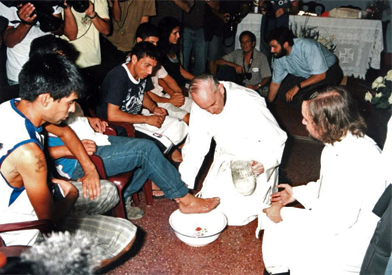 Jesus engaged in ministry publicly. Jesus spoke about how people treat one another. Jesus died at the hands of government – publicly. The prophets of old decried how society neglected the widow and the poor. Faith without works is dead, and one work of faith is to seek a more just society that improves the health and welfare of any who suffer injustice, indignity, poverty, hunger, and oppression of any kind. Faith is inherently public, and is inherently concerned with public things. After all, Jesus’ main way of speaking about God’s intent for humanity was to speak of the Kingdom of God. “The Kingdom of God is like ….” Kingdoms are societies. They are inherently social, public, corporate. The life of faith is not just something we keep to ourselves, individually. Even more. Faith is not just one part of our lives, but informs the whole of our lives. We do not put faith on and take faith off. Faith is not just found in one box in our closet, to be taken out on Sundays and holidays. Faith is part of all that we do. Faith informs all of our actions. Faith – and the God in whom we have faith – is concerned with all things (1 Corinthians 13:7). Thus faith led me to weep when nine African Americans were murdered while at prayer. When one member of the body of Christ suffers, I suffer. Faith led me to ask tough questions about the legacy of racism, the power of symbols, and the unfulfilled promise of “we the people” seeking to form “a more perfect union.” In faith I read where Scripture tells me that “love bears all things” (1 Corinthians 13:7), and that we are called to “bear another’s burdens” (Galatians 6:2). Looking at the burden of racism and the legacy of oppression that my sisters and brothers bear, I grieve and ask, “How can I bear this burden with them?” I don’t have a very good answer. The question gnaws at me. The status quo is not working. Racism persists. This sin, and the structures that were shaped by it, need to be dismantled. Faith led me to celebrate the Supreme Court ruling on marriage, extending marriage rights to same-gender couples in all fifty states. For years couples and families have lived without the dignity and legal protections of marriage. Medical decisions, estates, health insurance, shared property ownership, and so many other protections and opportunities were denied to same-gender couples and their families, to our neighbors and friends, to Soldiers wearing the uniform of the Armed Forces, to our fellow human beings and sisters and brothers in Christ. Legal prohibitions created a hardship for millions of people. Faith celebrates when hardships are alleviated, when “the lowly are lifted up” (Luke 1:52). Faith rejoices at wholeness and healing and justice. In neither of these issues am I directly implicated. I am not black. I am not gay. Yet that is precisely the point. Faith is not primarily concerned with the self. Our faith is primarily concerned with the whole of society and the care of the other. “Love does not insist on its own way,” writes Paul, speaking to the faith community in Corinth (1 Corinthians 13:5). Faith is oriented toward the justice and renewal of the Kingdom of God and those who live within it. Justice is experienced – and enacted – in community. Faith is inherently interested in the community and the world. So too, I believe, is the American Experiment. The United States was established by “we the people” to establish “a more perfect union.” The Bill of Rights was written to restrain society, its government, and its majorities from trampling on the rights of individuals. But more than a mere restraint function or a statement of the rights of individuals, the Bill of Rights and the eloquent call to create “a more perfect union” speak to a positive view of a society in which “liberty and justice for all” is the goal. In the critical conversations about race that our nation has begun since the Charleston shooting, and in the celebrations and hand-wringings and questions of “what’s next?” following the Supreme Court’s ruling, our nation is one step closer to realizing its calling to form a more perfect union. Such steps are difficult, and ours will never be a perfect union – sin will make sure of that. Yet we strive ever forward, as Christians and as Americans, to make ours a more perfect union. Such a more perfect union begins to take shape when our focus turns from self to other, and we recommit ourselves not to insisting on our own ways but instead to bearing others’ burdens … to seeking liberty and justice for all.